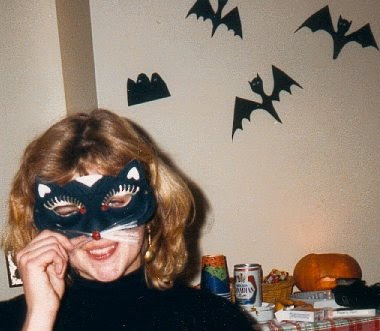 this is a old photo but it might be the last time i wore any kind of hallowe'en costume. it is certainly the last bit of photographic evidence of dressing up. happy, spooky hallowe'en! i went fishy on the last day having been so repulsed by the vegetarian options that, much to the surprise of fellow passengers and crew, i skipped several dining room meals in favour of fruit and muffins that are provided in the lounge (plus the cheese from the forks!) i found i was better off with small meals anyway seeing as what i was doing mostly was sitting. but for my last dinner i went to the lovely pink, deco dining room and had pickerel crusted in hemp seeds -- i thought about jack guppy's famous temagami pickerel dinners and hoped for the best. it was not as good as the jg version but it was yummy. i took pics of the meal but they turned out all blurry. perhaps it was the hot air coming from fmc! another brief bit of air for the passengers and crew in the beautiful town of capreol. see the mist rising off the water? i started to see outcroppings of canadian shield rock just after this marshy bit. i was surprisingly happy to see them. weird. i gleefully snapped some photos but they are just grey blurs. i went to the early dinner, mostly to avoid fmc and his boring and incessant droning on. as i was chatting about literacy work and community development with bonnie and alvin (?) from guelph - ahhhhh - we passed the sign that marks the border between manitoba and ontario. there was an announcement and the diners broke out in applause. i thought that was a bit odd. manitoba seems perfectly lovely to me. i stayed in the lounge to enjoy the free sparkly wine but when the self-proclaimed unrepentant free market capitalist started wittering on about the benefits of privatizing health care i retreated to my wee room. surprising to meet an unrepentant fmc in these times when even the staunchest fm idealogues are repenting and relenting ... and admitting it is an ideology! we win! i guess this guy had not heard the news yet. we got off the train for about 30 minutes and wandered around the forks. i got some cheese for me to eat with apples and rich tea biscuits supplied in the lounge. it is not great being a vegetarian on the train ... where vegetables go to die. i also got dad some maple syrup jelly and mum some rhubarb marmalade ... or at least i thought i got her rhubarb marmalade. turns out, in my haste i grabbed the wrong jar and brought home strawberry-rhubarb jam. not sure where we are here. still in sask or have we crossed into manitoba? sorry about the blurry photos. the train was moving FAST! but aren't the colours amazing? a guy from winnipeg told me that we are lucky the train is late because usually it goes through the valley at night. he also said the train is the only way to really travel through the valley as there is no highway. there is this geological tour online.